Your grandmother knew the Chop Rite by the name “Enterprise” and she trusted the American craftsmanship. Many of these grinders and presses can be found in antique stores today! 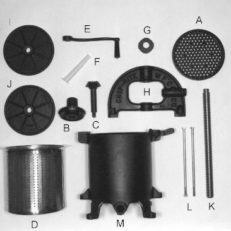 The timeless design means that you can easily pull that grinder out of retirement by purchasing replacement parts with corresponding dimensions and/or model numbers. Today, the company is known as “Chop Rite” but they use the same patterns as parts that they did in the beginning. Rest assured, that if you are buying the correct size Chop Rite part for an Enterprise meat grinder, it will work for you or we will return your money. If you do not see a specific part that you need, we can still get it for you! Contact us at customer@pantryparatus.com, or call us at 406-334-0185. Thank you!